A series of connections between the Liberal Party of Canada and the Walrus Foundation over the past two years may be affecting the standards and thrust of the journalism at the charity’s titular magazine. These connections include: Liberal candidate (now MP) Seamus O’Regan heading the publication’s Educational Review Committee, charged with vetting editorial content, during the last federal election; the addition of new party-affiliated members to the foundation’s board of directors; the hiring of former Justin Trudeau ghostwriter Jonathan Kay and subsequent spate of pro-Trudeau articles during his tenure; and the Heritage Ministry’s approval of multiple hard-to-obtain Canada 150 grants. The Walrus is a unique case of charitable journalism in Canada, and with the federal government now reassessing its role in supporting Canadian media — and considering the Shattered Mirror report’s recommendation for more such charitable projects — how The Walrus has or hasn’t met its obligations suddenly becomes relevant. Before, during, and after the 2015 federal election, Liberal candidate-turned-MP Seamus O’Regan held a series of high-level positions at the organization. The former CTV broadcaster joined the Walrus Foundation’s board of directors in January 2014 and stayed on it after winning the Liberal nomination in the Newfoundland and Labrador riding of St. John’s South–Mount Pearl in late September of that year. He also became chair of the publication’s Educational Review Committee (ERC), first appearing in that role on the masthead of its June 2015 issue, after already campaigning for the Liberals for months. O’Regan remained on the masthead as ERC chair until the end of 2015, after his and his party’s victory in the October 19th election. He is still listed as a member of the National Advisory Council, a body within the foundation that is also responsible for evaluating editorial content. Other board members include: Chima Nkemdirim, chief of staff to Calgary Mayor Naheed Nenshi, who was added in early 2015 — a year after Trudeau (unsuccessfully) courted the “unabashed” supporter to run as a candidate; Jodi Butts, spouse of the prime minister’s best friend and principal secretary Gerald, who joined in mid-2016; and “long-time Liberal insider” Helen Burstyn, who was elevated to chair around the same time. Beyond his political involvement with the Liberal party, O’Regan is also part of Trudeau’s inner circle, and is godfather to at least one of Gerald and Jodi Butts’ children. More recently, he and his husband attended the prime minister’s controversial family trip over the holiday season to the Aga Khan’s private island getaway. Throughout O’Regan’s 2015 stint as the ostensible head vetter of The Walrus’s journalism — while also being a Walrus Foundation board member and Liberal candidate/MP — the political content published by the magazine ramped up. Shortly after O’Regan joined the board, The Walrus published “Justin and Gerald” in its May 2014 issue — a gushing piece about Trudeau’s “whip smart” best friend and top aide Butts. In the October 2015 issue, The Walrus published “Number Cruncher: Coffee and Quantum Physics with the Liberals’ Digital Savant,” an effusive piece about Trudeau’s national field strategist. But the most pro-Liberal pieces have been published exclusively on The Walrus’s website, where the publication appears to be placing more emphasis as the magazine’s paid subscriptions continue to decline. Hey @jonkay, congratulations on the new gig. I’m a monthly @walrusmagazine reader from Day 1. Great choice. In the piece, Kay described the time he spent with Trudeau while working as a freelance assistant on his memoir, Common Ground, in late 2013. According to Joly’s press secretary, Pierre-Olivier Herbert, the Canada 150 Fund had thousands of applications and billions of dollars in asks, of which only a small fraction were approved. Yet the foundation received two sizeable grants from the highly sought-after fund. Herbert adds in a subsequent interview, however, that nothing gets to the Heritage minister’s office for approval if it’s not recommended by the department beforehand. “So in terms of what we approve as projects, even supplements, it goes through a vetting process — non-political vetting process — with the department first,” he says in a phone call. But was it appropriate for a Liberal candidate, then MP, and family friend of Justin Trudeau to have the formative responsibility of “vetting all new proposed editorial content” for the magazine? Was it appropriate for the charity to hire a Trudeau ghostwriter as its editor-in-chief less than a year before an election? CANADALAND repeatedly reached out to O’Regan at his Ottawa office; despite a staffer’s assurance of an imminent response, we have yet to hear back. We also reached out to Kay, but he referred such questions to publisher Shelley Ambrose, who did not respond to our requests. The masthead of the June 2015 issue, on which Seamus O’Regan made his debut as ERC chair. It is, however, unclear whether the ERC still even performs its role of vetting all content as stipulated in the charitable agreement to ensure that at least 70 per cent of the magazine is educational in nature. But the ERC’s current vice chair, University of Calgary professor Mark Migotti, says the members now only review content after production and that this changed about two years ago. He doesn’t know whether or not the chair — now Prentice — still vets proposed editorial content, or did during O’Regan’s tenure. 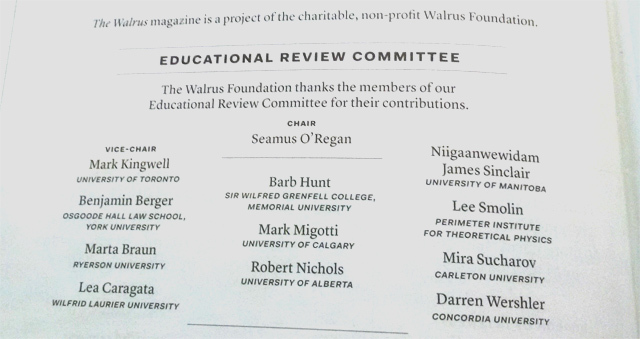 If the ERC is no longer vetting content, it would be another strike against the Walrus Foundation. Over the last year and a half, CANADALAND has documented the discontinuation of programs agreed upon under the charitable status agreement; allegedly stealing a freelancer’s pitch; alleged workplace abuse; the discontinuation of a paid internship program and its subsequent reinstatement after the organization was found in violation of labour laws; and overstating falling circulation numbers in grant applications. On top of all of the above, our analysis has shown that educational content within the magazine appears to have fallen below the 70 per cent minimum set out under the charitable status agreement. For instance, the 2015 winter double issue is 76 pages from front to back and has a 58.5:41.5 ratio of content to ads, which the document states should be counted toward the non-educational tally. Although the Canada Revenue Agency has not reprimanded The Walrus, and audits are not disclosed to the public, CRA media relations representative Patrick Samson says the agency generally takes “an education-first approach where possible” when a charity is found in non-compliance. All of which prompts the question: If The Walrus foreshadows the type of content future charitable journalism outfits will produce in Canada, would they be worth getting behind? Correction (4/12/17, 9:00 p.m.): Due to an editing error, this piece originally stated that Jonathan Kay had “been hired away from the National Post in the spring” of 2015. But while Kay first appeared as editor-in-chief on the Walrus masthead at that time, he in fact started there the previous December. Similarly, a reference to Kay having been hired “months before an election” has been amended.